Violet Tinnirello gets nervous sometimes. It can happen just before she’s about to go on stage, or before a big audition and especially if it’s a part she really really wants. Like Shirley Temple. Violet, a third-grader at Sanfordville Elementary, says she has “always always always” dreamed of portraying the young Depression-era superstar. “Always” began three years ago, when Violet was just 5 years old, and her mom took her to see “Chasing Rainbows, the Road to Oz” an off-Broadway musical about Judy Garland. It was the role of Shirley Temple that captivated little Violet, and by the time the curtain came down, she had set her mind on one day landing the part. Now 8, Violet’s resume includes television commercials, voice-overs, and even an appearance on Sesame Street. Being an actress is great fun, she says, but there’s also quite a bit of work. There are auditions, plus lessons and rehearsals. 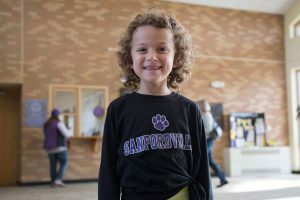 Violet’s principal at Sanfordville Elementary School, Johnna Maraia, says Violet’s positive attitude has a ripple effect in the school, and that Violet is a little leader among her peers. “She always brings the sunshine,” says Ms. Maraia. School, says Violet, is just as wonderful as performing. Then this past summer, “Chasing Rainbows” needed a Shirley Temple for an industry-only performance. Violet was asked to audition, and she definitely got just a little nervous. She knows that other people, even grown-ups, get nervous, too. Her advice?